Brigadier General Stuart Campbell Taylor DSO (93rd Brigade, 31st Division) dies of wounds received in action ten days prior at age 45. While on an inspection tour of his battalions he is seriously wounded in the head and body by shellfire. He took part in the operations on the North West Frontier in 1897-98 and fought in the South African War in the advance on Kimberley and actions at Belmont, Enslin, Modder River and Magersfontein. 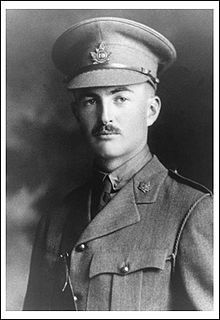 When with attacking troops northeast of Cambrai which come under heavy enfilade machine-gun fire from a neighboring village Lieutenant Wallace Lloyd Algie (Central Ontario Regiment) rushes forward with nine volunteers. He shoots the crew of an enemy machine gun, and, turning the machine on the enemy, enables his party to reach the village. He then rushes another machine gun, kills the crew, captures an officer and ten of the enemy and thereby clears the end of the village. Lieutenant Algie, having established his party, goes back for reinforcements, but is killed when leading them forward. For his valor and personal initiative in the face of intense fire and saving many lives and enabling the position to be held he will be awarded the Victoria Cross posthumously. Captain John Herbert Towne Letts MC (Lincolnshire Regiment attached Royal Air Force) is accidentally killed at age 21. He is a 13-victory ace. Lieutenant Ernest Edward Tuckett (Royal Naval Volunteer Resereve) dies on service at age 27. His son will die on service in 1945 and is buried in the same cemetery in Yorkshire. Lieutenant Ronald Cecil Vernon (General Depot Staff, South African Forces) dies in South Africa at age 26. He is the son of the Reverend James Campbell Vernon. Second Lieutenant Samuel Richard Ernest Walker (Northumberland Fusiliers) is killed in action at age 28. He is the son of the Reverend Canon Philip James Walker. Chaplain Frederick Walter Cleveland MC (attached North Staffordshire Regiment) dies of wounds received one week ago at age 30. He was the Curate at Christ Church, Tunstall. Second Lieutenant Frank Watson Ballard (Northamptonshire Regiment) dies of wounds at age 28. His brother was killed in July 1915. Lance Corporal E B Stittle (Royal Engineers) is killed at age 26. His brother was killed in June 1915. Private Alfred Whalley (Royal Inniskilling Fusiliers) is killed in action. His brother was killed in June 1917.